Rattlesnake Gulch begins at the entrance to Eldorado Canyon State Park. Eldorado is a world renowned climbing area with red rock walls rising vertically from the valley floor, which is cut by South Boulder Creek. 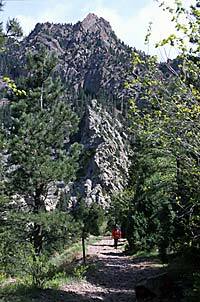 The trail winds up the southern flank of 8,335 foot Eldorado Mountain, crossing an old railroad grading and a small stream on its way to the ruins of The Crags Hotel, a small hotel that was run in the early 1900s. Rattlesnake Gulch offers beautiful views across the valley floor, where you can spot raptors and watch climbers attempting the many routes on the canyon walls.